We bring you another great release from the guys at Miniclip and they surely outdone themselves this time with this brand new sports game. 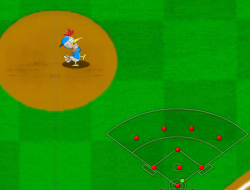 The game is called Miniclip Allstar Baseball and you get to choose between the squirrel and the chicken. Pick your favorite and then head down to the court and start batting. Once you are done with that you will get to play the role of the pitcher and try to throw some nice balls that the opponent will not be able to hit. If they do hit it you must stop them from reaching the base. Miniclip Allstar Baseball 6.50 between 0 and 10 based on 4 votes.